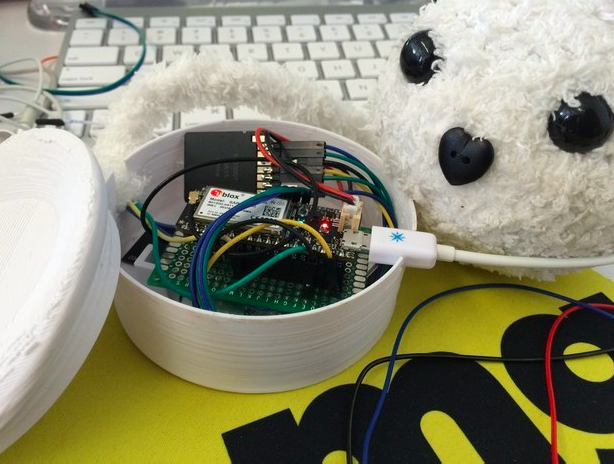 What’s a media company doing making stuffed animals that can read your emotions? Figuring out the future, apparently. Received wisdom in business is that young companies innovate so naturally they don’t need help or special programs to foster innovation. So when a young media business like BuzzFeed starts an innovation “lab,” it feels something like a college freshman sporting grandpa’s golf pants. Still, BuzzFeed, which was founded in 2006, started something called the BuzzFeed Open Lab one year ago; we caught up with BuzzFeed’s CEO and founder Jonah Peretti to find out how it’s impacting the company overall. Peretti said his inspiration for BuzzFeed Open Lab came partly from his own experience as a fellow at a tech, media and arts organization in New York called Eyebeam. Peretti said fellows in the experimental program over the past year developed futuristic technology and projects that stand to transform the way BuzzFeed sources news and tells stories for years to come. BuzzFeed Open Lab fellow Ben Kreimer flies a newsgathering drone. While that could mean Open Lab contributes to BuzzFeed’s profitability in the end, don’t confuse it with an incubator or accelerator. Fellowship money, office space, equipment and mentorship are granted with no strings attached. BuzzFeed Open Lab is not the only place where the media company hashes out new uses for emerging technology, of course. In recent examples, BuzzFeed launched Tasty and Proper Tasty in December 2015. The Facebook-only food video channels now garner billions of views every month, and have become a big franchise for BuzzFeed, Peretti said. More recently, BuzzFeed announced a reorganization of sorts, including the launch of BuzzFeed Entertainment Group, an entertainment division headed by Ze Frank, and video teams to support news and entertainment, separately. Video used to be a separate division within the company. BuzzFeed’s Tasty channel has been a viral hit on Facebook. BuzzFeed Open Lab fellows instead spend time on tech that isn’t pervasively used as something like Facebook, Snapchat, livestreaming and online video are today. They also explore, and sometimes create, media formats that haven’t become dominant — and may never, in fact. The idea for the lab was also partly inspired by his sister’s early career. Stand-up comedian, actress and writer Chelsea Peretti got started as part of a comedy troupe called Variety SHAC. “She would get together with people to try ideas, or test out materials, and with limited resources would learn so much because they had total freedom to experiment,” her brother recalls. According to BuzzFeed’s bureau chief in San Francisco Mat Honan, and BuzzFeed Open Lab senior fellow Amanda Hickman, the fellows in San Francisco frequently interact with the company’s editorial staff, and vice versa. News professionals can help fellows think about applying sophisticated technology practically to problems they may have never realized were a part of news gathering and production. Having a bunch of engineers and developers in-house has also given BuzzFeed reporters a resource for figuring things out like the technological feasibility of different inventions, or the impact of a certain development in an industry that they’re writing about, Honan said. The fellows present their work at a Show and Tell, the creative world’s answer to a Demo Day. Fellows in the most recent cohort developed news gathering drones, 360-video creation tools, VR content editing programs, data analytics and bot-driven systems for news gathering and investigations, and robots that are cuddly, and when held, help users track their own biometric and emotional responses to different stories they read or videos they watch. “There’s a lot of hardware or interactive stuff that’s nice, but it’s not helpful or useful to people. I’m building weird interface experiments that should make your life easier, including emotionally, while also being protective of you and your data,” said engineer and Open Lab fellow, Christine Sunu. Honan said he could see Sunu’s “emotionally connected toys” being used as a next-generation type of Nielsen People Meter if she wanted to find a commercial application for them. But so far, she doesn’t want to go commercial, Sunu confirmed. Perhaps the most anti-commercial project in the inaugural cohort of BuzzFeed Open Labs is the Saito Group’s “data poetry projection” system. Saito Group demonstrated a poetry-generating projector at BuzzFeed Open Lab’s Show and Tell. The pseudonymously named Saito Group automatically ingests social media posts, namely Tweets and geolocation data, then turns them into found poems, which are projected onto surfaces like brick walls in public locations where they will likely have personal resonance with passersby. The developer behind the Saito Group declined to be named for this story as a condition of speaking with TechCrunch. Honan and Hickman said from the start they have focused outreach around diversity and inclusion, making sure to go beyond the usual suspects in tech in Silicon Valley to promote their program and draw in applicants. BuzzFeed CEO Jonah Peretti . Asked what futuristic technologies, including from the Open Lab, BuzzFeed may soon employ, Peretti said: AI, virtual reality, drones and bots were all on his mind. Peretti also said, perhaps too humbly, it would be easier for robots to steal the job of a CEO than that of any writer or creative.